Franz Anton Hoffmeister was born in Rothenburg (Austria) in May 1754. He was only 14 years old when he arrived in Vienna to study law. Very soon, he took interest in the rich musical life of Vienna and, after having obtained his diploma, decided to devote himself to music. He took lessons from Johann Georg Albrechtsberger, the composer who was to become the tutor of Ludwig van Beethoven. Hoffmeister publishes his first symphonies in 1778 as he becomes chapel master for the Hungarian Count Franz von Szécsényi. By 1780, he is one of the town’s most popular composers with quite a substantial catalogue of works. changed names to become CF Peters, by then one of the world’s leaders in musical publishing. In 1799, Hoffmeister and the flutist Franz Thurner gave a series of concerts which took them to London.They join forces to create a new publishing house. Hoffmeiser keeps both the Viennese and the new Liepzig publishing houses until 1805 when he cedes the Vienna firm to Kühnel and from 1806 he returns to composing. Twenty years later, he sells his business to Druckerey.Today, he is known almost exclusively for his music publishing activities, but he has composed over 70 works : symphonies, string quartets (some of which were attributed to Hayden at one point),chamber music and some operas.Some of his works were played at the famous Salomon concerts at the beginning of 1790. 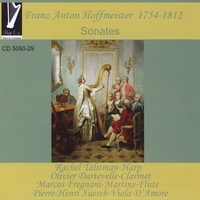 Hoffmeister was a friend of Mozart’s who dedicated to him his string quartets KV 499, whilst Beethoven called him “my dear brother”.Among the four sonatas recorded here, only the one for harp was originally composed for that instrument. The pianoforte parts of the other three have been transcribed for the harp by Rachel Talitman. The melodic qualities of these sonatas their fluidity as well as the solidity of their very classic construction, makes them extremely pleasant to listen to.It was not by coincidence that Mozart and Beethoven, both of whom were renown for their intolerance of mediocrity, extended their friendship to him.